Crashed into a field and flipped over. 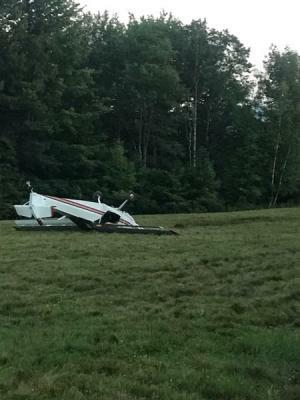 JEWETT — A Berkshire County man is lucky to be alive after the plane he was piloting made a hard landing and flipped over in a Jewett field Thursday afternoon, police said. Roger C. Tryon, 64, of Monterey, Massachusetts, sustained minor injuries, Greene County Sheriff Greg Seeley said. Tryon did not have to be taken to a hospital. Tryon suffered facial cuts and bruises, said Lt. Tracey Quinn with the Greene County Sheriff’s Office. Tryon took off from Indiana and was on his way to refuel at the Columbia County Airport, located off Route 9H in Ghent, when he ran out of fuel. He was likely on his way home to Massachusetts after the planned stop, Seeley said. Tryon wanted to land the aircraft in the Jewett field, but the plane’s wheel sunk into the ground during the landing attempt, which caused it to flip over. “He almost made it to Columbia County,” Seeley said Thursday night. Police do not know if Tryon was flying a private plane or had rented one for the trip. Tryon holds a certificate as a private pilot and is rated on single-engine airplanes, according to an airman details report from the Federal Aviation Administration. The crash remains under investigation by the FAA, Quinn said. The plane was removed from the scene and examined. In May, a plane also piloted by a man named Roger Tryon of Monterey, Massachusetts, had to make an emergency landing in a farmer’s field in Taghkanic. Tryon, who had one passenger on board, was flying a single-engine airplane when the engine stalled May 26 at about 12:30 p.m., according to the Columbia County Sheriff’s Office. Police could not confirm Friday if the pilots in each incident are the same person. The men were on their way from the Hudson Valley Regional Airport in Wappingers Falls to the Great Barrington Airport in Great Barrington, Massachusetts, in May, when the plane’s engine started to sputter. Tryon had to make an emergency landing in a grassy field off Koeppe Road. As Tryon’s plane dived toward the ground, it lost its landing gear, including its wheels, which caused the plane to make a “pancake landing,” police said in May. The left wing struck the ground, spinning the aircraft 180 degrees. The plane’s engine and belly were damaged as a result of the forced landing, but both men were unharmed.